Well today I have several goodies to share and it’s all fun stuff so I’m calling it Fun Stuff Friday. Makes sense right? 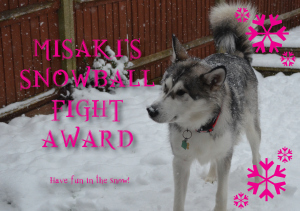 First FUN thing is that my friend the lovely Misaki has had a TON of fun herself with all the snow she’s had where she lives. Playing in the snow is really her playing in her element – after all she’s a SNOW DOG! YAY! She was so happy about having snow she made this way cool award badge for everybody to celebrate SNOW……..isn’t it grand? 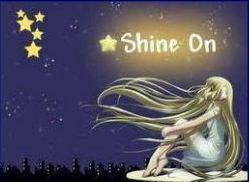 Then I also got another award this week…….it’s one I think is perhaps one of the prettiest designs I’ve seen – it just looks kind of magical or something so I’m VERY pleased to get it from my very good buddy Nerissa at Nerissa’s Life. It’s also an award that has “no strings attached” – can’t beat that can you??!! If you would like to have this particular award feel free to take it……it’s a beauty isn’t it? Other than those two things today is housecleaning day – you know how I feel about that…..but you also know I have my own way of dealing with it – – – HELLO BASEMENT HERE I COME!! !